Badminton Sensei coaches are Badminton England registered and have passed CRB checks. Always ask your coach for a copy of his or her qualifications before engaging their services. To enquire about any of our coaches, please complete the enquiry form at the bottom of this page. Alan is a forward thinking, positive badminton coach based in Watford and covering North London and the Home Counties. Alan has helped many beginners, improvers and club players with their game. He has coached the Hertsmere Youth badminton team annually since 2010 and helped to coach the Hertfordshire under-17 squad in the 2013-2014 season. One of his junior athletes has just been selected for the Berkshire youth squad at the age of 8, following two years of one-to-one badminton coaching. He is a fitness guru and can help with other aspects of your development including fitness, diet and stretching. 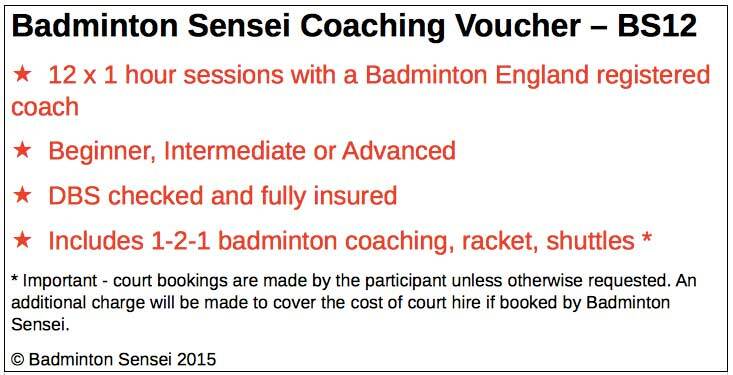 His friendly, positive approach to coaching allows you to achieve your badminton goals in a manner suited to you. Alan began playing badminton in 1987. Early on, he was school singles champion and went on to captain Manchester University's 2nd team for 2 years, helping them reach the BUSA quarter finals in 1998. He has played in Middlesex for Swerves, HLC, Hale and Chequers as well as for the famous Comets club based in HSV, Hatfield. In 2010 he qualified as a Level 2 coach and has managed the Hertsmere Youth Badminton Team since 2010. In 2012, Alan was runner-up in the Kent Gold Masters over-35s singles. Team accolades won include Hammersmith men's Division 1 winner on two occasions with Hale, Middlesex men's Division 4 and 3 winners, plus Middlesex mixed Division 2 with Chequers and, most recently, the Hertfordshire Division 2 men's championship with Comets. He has represented his county at singles, mixed and level doubles. Specialties: Badminton coaching, sports psychology, fitness training, fitness programs, positive thinking, time management, goal setting. "I have worked with Alan for two years and he has always been approachable and has a good manner with both children and adults. He is reliable and dependable and has good time management skills. Alan is a good badminton coach and ensures he works with the individual and the group. He has achieved success with the Hertsmere Badminton team in the Hertfordshire Youth Games. Phil is a friendly, highly motivational badminton coach based in Hertfordshire. He has been coaching badminton for several years and is always looking for ways to improve so he can assist his players to the best of his ability. He has a real passion for sport and he is currently studying for his UKCC Level 3 coaching qualification. He represented his county from the age of 14 to 18 and undertook his first coaching qualification at the age of 16. When he was 18 he achieved Level 2 coaching status and has been coaching badminton ever since. Phil currently coaches county children from U11 to U17 and coaches at many leisure centres across Hertfordshire. Phil also holds Level 1 football and tennis coaching badges. "My kids have become county players with Phil's coaching" - Patrick S.
"Phil got me back into playing at a club level again!" - Nigel D.
Dave has been coaching for many years and has recently been recognised for his achievements by being voted Barnet coach of the year 2010. He coaches and plays for the Middlesex County Badminton team and, in addition to being a UKCC Level 2 coach, is also a Badminton England Tutor. Dave has been the in-house coach for the London Badminton Bonanza for the last two years, which has been an overwhelming success. He was formerly the Head Coach at Imperial College London University and has experience of coaching across many age ranges including local school programmes, to bring a passion for badminton to the new generation. Dave is currently the resident badminton Tutor at South Thames College where he designs and runs adult sessions which cater for a variety of abilities, from beginners to advanced. Covering Barnet and West London, Dave will bring a wealth of experience from badminton and other sports coaching to add to your game. Fill out the enquiry form to get in touch. David is an experienced badminton coach covering the Hertfordshire area along with North Middlesex and Beds. David brings a positive, focussed attitude to his coaching along with experience based upon personal playing and coaching successes. David was under 16, 18 and 21 Hertfordshire County Champion and played County Senior 1st team for a number of seasons. David was coached by Bill and Andy Goode for a number of years and, additionally, by Roger Mills at Wimbledon Racket and Fitness Club. David got involved with coaching a number of years ago when a coaching friend, had to have an operation and asked David to take on a young county Junior for him. This progressed into a 1-2 sessions of 2 hours a week coaching and saw her achieve a number 3 in England ranking. David then decided to go full time and obtain all of his qualifications and now has a number of individual and club clients that he coaches on a regular basis. He currently coaches the Hertfordshire under 17 team. With a professional, attentive manner, David is sure to take your game to the next level.